The growth in the Bioinformatics and Computational Biology fields over the last few years has been remarkable and the trend is to increase its pace. In fact, the need for computational techniques that can efficiently handle the huge amounts of data produced by the new experimental techniques in Biology is still increasing driven by new advances in Next Generation Sequencing, several types of the s… o called omics data and image acquisition, just to name a few. The analysis of the datasets that produces and its integration call for new algorithms and approaches from fields such as Databases, Statistics, Data Mining, Machine Learning, Optimization, Computer Science and Artificial Intelligence. Within this scenario of increasing data availability, Systems Biology has also been emerging as an alternative to the reductionist view that dominated biological research in the last decades. Indeed, Biology is more and more a science of information requiring tools from the computational sciences. In the last few years, we have seen the surge of a new generation of interdisciplinary scientists that have a strong background in the biological and computational sciences. 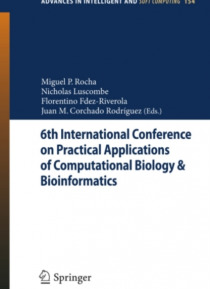 In this context, the interaction of researchers from different scientific fields is, more than ever, of foremost importance boosting the research efforts in the field and contributing to the education of a new generation of Bioinformatics scientists. PACBB'12 hopes to contribute to this effort promoting this fruitful interaction. PACBB'12 technical program included 32 papers from a submission pool of 61 papers spanning many different sub-fields in Bioinformatics and Computational Biology. Therefore, the conference will certainly have promoted the interaction of scientists from diverse research groups and with a distinct background (computer scientists, mathematicians, biologists). The scientific content will certainly be challenging and will promote the improvement of the work that is being developed by each of the participants.